PAXsims is pleased to provide Connections UK update, via Graham Longley-Brown. The 2019 Connections UK conference will be held on 3-5 September 2019 at King’s College London. Registration will open in early summer. Many thanks to all of you who completed the Connections UK 2018 feedback survey. This is a fantastic 61% response rate; we have analysed feedback from 132 attendees out of the 216 that attended Connections UK 2018 and, as ever, based the 2019 conference on your suggestions. The resulting conference outline is below. Please note the dates Tuesday 3 – Thursday 5 September 2019 in your diary. I will send you registration details presently. More details of Connections UK, including all previous presentations, can be found at http://professionalwargaming.co.uk/index.html If you do not wish to be on this email distribution list, please let me know and your name will be removed from further announcements relating to Connections UK. 98% of respondents found the 2018 conference very valuable or valuable. If it ain’t broke, don’t fix it; the general structure and approach of the conference are sound. 56% of respondents had not attended Connections UK previously. We are attracting many new people. 60% of respondents would like more parallel sessions offering differing levels of discussion. This is a key result that will shape the 2019 conference. 91% of respondents found the conference length just right. We will again run a three-day event. An extended Introduction to Wargaming course, interleaved with other conference activities. More hands-on gaming, show-casing a wide variety of wargame types. This as well as the usual Games Fair, which rated very well. A shorter megagame, and this as one of several alternative games played on Day 1. Plenary sessions on the topics shown in the table below. Concurrent ‘Deep Dive’ masterclasses into the topics shown in the table below. Separate ‘streams’ on automation, and analysis & data capture. Provide no meals. Rather, the KCL cafeteria will operate on a pay-as-you-dine basis. You can, of course, bring your own packed meals or pop out to the many local eateries. Drinks during breaks will be provided. Charge for one ticket, which will cover all three days. The cost will be as low as we can make it to cover the basic administrative and facilities charges. We do not know the final price yet, but expect it to be under £100 – but please note this is TBC. The Introduction to Wargaming Course will be run by Tom Mouat on Days 1 and 2 of the conference. Day 1 will include a smaller megagame as one of a number of games and formats, all running in parallel. Simultaneous Deep Dives and streams, so you will have to choose which to attend. There will still be central plenaries, which everyone attends, and lots of time for coffee-fuelled networking. The scope of Connections UK is expanding. We would appreciate your suggestions for the following – but please note that, as a paying conference, we must maintain a reasonable level of quality. It would also help if you could suggest definitive ideas, rather than vague (“Why don’t you think about…”) notions that need a lot of work to flesh out. Automated methods, models and tools that support wargames, especially data capture & analysis. Games for Day 1 that involve 15 – 20 (+) players that you can bring and run. We have four (including the megagame), and probably need another eight. Games for the Day 2 Games Fair that involve approximately 6 – 12 players. Prof Phil Sabin will coordinate this, as usual, but please start thinking about games that demonstrate the breadth of types of wargame, including computer-assisted and computerised games. Gaming beyond Defence. This will be a Day 3 plenary session. Please suggest good speakers who can talk to the ‘gaming’ in ‘wargaming’ beyond a Defence context. Connections UK purpose. 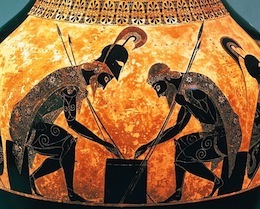 Advance and preserve the art, science and application of wargaming. Dates. Tuesday 3 – Thursday 5 September 2019. Venue. Kings College London, The Strand, London, UK. Cost: TBC but as low as possible, and one ticket for all three days. Key note speakers: Dr Lynette Nusbacher and the Head of the UK MOD Development, Concepts and Doctrine Centre (DCDC). Outline. Details remain TBC, but the conference structure should look like that shown below. The Connections UK 2018 professional wargaming conference concluded yesterday, and a very excellent conference it was. 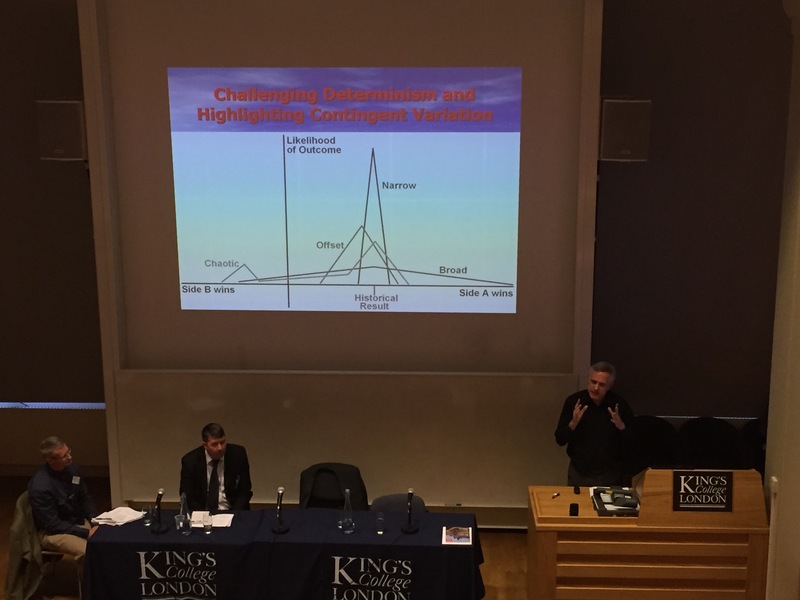 The event was hosted by the Department of War Studies at King’s College London, and cosponsored by the Defence Academy of the UK and the Defence Science and Technology Laboratory. Around two hundred people were in attendance this year, making it the second largest conference of its kind ever (with Connections US having taken first spot earlier this year). As is tradition with Connections UK, the first day gave participants the option of either attending a day-long introduction to wargaming for beginners course (ably taught by Tom Mouat and Jerry Elsmore), or taking part in a megagame designed by Jim Wallman. The former included hands-on experience with Battlegroup Krieggspiel, a commercial off-the-shelf (COTS) game, and a matrix game. The megagame was A Green and Pleasant Land, examining British national resilience in the face of mounting crisis and a hostile adversary employing the tools of hybrid warfare. Together with about a hundred others, I opted for the megagame, facilitating the game as Control for the Red Cell—a team of nefarious simulated Russians trying to destabilize the UK against the backdrop of a crisis in the Baltics and NATO mobilization. Led by the nefarious Phil Pournelle (doing his best Vladimir Putin imitation), the Read Team used social media to aggravate political tensions, secretly funded alt-right demonstrations, and engaged in sporadic arson attacks—hoping to overwhelm the overstretched British police. There was also quite a lot of hacking, including an extraction of interesting financial information from the Trump Organization, and sabotage of the Automatic Identification System (AIS) used for maritime navigation. The British Prime Minister speaks to the cabinet and other officials. Photo credit: Jim Wallman/Stone Paper Scissors. The vast majority of players assumed the roles of various British government departments and officials, trying to deal with a plethora of incidents. Most incidents were simply random events that had nothing to do with Russia, but even those that were connected were rarely linked back to Moscow. There were, however, some exceptions. A GRU agent who had been hiring neo-Nazi thugs to torch British mosques was arrested by the Metropolitan Police. Even more serious, a Spetsnaz mission to sabotage Royal Navy vessels in Portsmouth was detected and blocked—ultimately resulting in the arrest of the Russian special forces. This occurred amid growing military tensions in Europe. When the British cabinet twice relocated to a secure bunker outside London—once as a continuity-of-govermnment drill, the second time in response to the discovery of Russian listening devices at Number 10 and the cabinet offices—Russia grew fearful that this might be early warning of an impending NATO first strike. As tensions rose, so did the level of problems that we had to find solutions to. The discovery of listening devices in the Cabinet Room and the arrest of a four-man team of Speznatz in Portsmouth precipitated matters, and we – the Cabinet – moved to the secure bunker, along with representatives (usually the PUS) of the ministerial teams. I think that I shocked my Cabinet colleagues when I ordered that all means – however extreme they might be – should be used to extract information from the captured Russian Special Forces Team. I asked that it be done by contractors and that it should take place outside the UK. I then told the Cabinet that this was a decision that I alone would make, and that they bore no responsibility for it. Once we did manage to talk, we were able to de-escalate the situation, with both sides agreeing to pull back … although I suspect that we withdrew more than they did! At this point the game ended, and we moved to the de-brief. A Green and Distant Land was not intended to be a hyper-realistic simulation of British emergency preparedness. Rather, it was intended as a conference ice-breaker, an opportunity to network, and a demonstrator for various gaming techniques. This it did very well, and there were several game elements that I am likely to steal borrow from Jim in my own future game designs. Day 2 of Connections UK—and the first day of conference panels and presentations—started off with a formal welcome from Wyn Bowen, Head of the School of Security Studies at King’s College London. Conference coorganizer Graham Longley-Brown (LBS) then outlined the conference programme..
Graham Longley-Brown discusses the wargaming process and the structure of the conference. He noted a number of areas in which he felt that wargame project management and validation was much more advanced in the US than in the UK and elsewhere. This was followed by a session on wargame design, introduced and chaired by Matt Caffrey (US Air Force Material Command). incorporating these into a game by providing players with choices and options. Dilemmas may be rooted in incalculability (the sheer number of possible approaches), uncertainty (for example, hidden information), and incommensurability. Wargames also have the potential to reveal previously unidentified dilemmas and elicit creative approaches. Game designer Brian Train spoke on game design as a form of journalism, focusing on “news games.” He noted that while the scholarly literature on such games has largely focused on digital games, there is a rich tradition of manual games that have editorial/advocacy/social awareness or documentary/educational/informative content. His earliest example was a 1791 roll-and-move game of the French Revolution. Another example was Occupation, a game that was secretly produced during WWII on German-occupied Jersey. Today, TerrorBull Gamesis well-known for its satirical and educational games. Brian also discussed the Strategy & Tactics model of games coupled with accompanying magazine analysis. Finally, Brian addressed the rapid development of games to explore contemporary or ongoing conflicts. Anna Nettleship addressed challenges in wargame design. In historical games, she noted, one must abstract real events in-game mechanics, and to do so in a way that remains appropriately playable for the players. The game design, rules, and supporting material must communicate effectively with the player. The game system should incentivize appropriate play. She stressed the importance of intensive playtesting in identifying weaknesses and fixing them. Regarding future conflict simulations, she noted the importance of linking the game design to design objectives. Players need to think how they can best get players to act within their game roles. During subsequent discussion, several audience members raised the challenges of wargaming future conflict, including hybrid warfare. Phil highlighted the need to couple the lessons of the past with an appreciation of the possible effects of technological change as well as leaving scope for innovative play by players. Brian stressed the importance of exploring how different actors might exploit various mechanisms of hybrid warfare, even if the game is necessarily speculative. Anna and Phil also noted that wargames can be useful in telling us what might happen, even if there can be no certainty the games are indeed predictive. The next series of presentations, chaired by Graham Longley-Brown, examined wargame development. Dave Manley (UK MoD) reviewed the High Northseries of nested games. The project grew out of Connections UK 2017 conference, and the interest in future arctic issues by the Development, Concepts and Doctrine Centre. A matrix game was used to explore strategic and political issues, RCAT was used to explore operational issues, and the ASUW game was used to explore tactical issues. He helpfully identified a series of risks, difficulties, and mitigations. One was the necessity of keeping players on (analytical) target, which was mitigated by the game controller nudging and “critical thinker” SME comments. Another was unexpected flow-down factors, where a higher-level game would introduce issues and challenges that needed to then be incorporated into a lower-level game. Free kriegsspiel seemed most appropriate for the higher level game, becoming more rigid in the more operational and tactical games. One observation that came out of the games was the unlikelihood of open military confrontation in the High Arctic. Highly regarded wargame designer (and former CIA instructor) Volko Ruhnke spoke about model calibration. He started with the challenge of building harpsichords at home to highlight how to develop a finely tuned instrument, noting that tuning is a different skill than both design and play. He differentiated between calibration (model outputs are useful for intended purpose) and accuracy(the model reflects real-world dynamics)—essentially, processes of validation and verification. He ran a quick live-action game that was, in essence, a pandemic model. Volko Ruhnke discusses wargame calibration. He then used this to highlight how, by changing the rules and rates and tweaking the model, rather different outcomes would result. There is value in “bracketing the target” by making adjustments that both overrepresent and underrepresent the desired effect, thereby enabling one to narrow down the required changes. In response to questions, he noted that calibration occurs throughout the design and playtest process. Lunch followed, and the first session of the Connections Game Fair, with twenty or so games on display,. These ranged from a Dstl hybrid warfare matrix game and their STRIKE! battlegroup board game, to a Swedish National Defence University operational-level game, through to Brian Train’s Second Lebanon War and a game on Future Artillery Concepts. A second session followed in the evening. Juliette Le Ménahèze, Harrison Brewer, and I ran two games of We Are Coming, Nineveh, our wargame-in-development of Iraqi operations against Daesh in West Mosul (2017). I’ll post a full update on the playtesting to PAXsims in the near future. Demonstrating Playing We Are Coming, Nineveh.. Photo credit: Harrison Brewer. Unfortunately, because I was busy overseeing bitter street-fighting in West Mosul, I did not get much of a chance to look at the others. Mike Young demonstrates the STRIKE! wargame from Dstl. Photo credit: Tom Mouat. James Halstead and Fog on the Somme. Photo credit: Tom Mouat. Brian Train demonstrates Second Lebanon War. Photo credit: Tom Mouat. Tom Mouat’s Section Commander. Photo credit: Tom Mouat. The WATU wargame was also on display (photo credits: Katie Bramwell). The other activity of Day 2 was a keynote address by Volko Ruhnke and Brian Train. Volko spoke about wargames and systems thinking, reprising many of his comments from Connections US in July. He identified various sources of analytical surprise—deliberate hostile action, tectonic shifts, and system shifts in which the dynamics of complex systems interact to produce major change. From this he went on to explore the challenge of modelling complex systems, noting both that such models are inevitably simplified and full or errors—yet also essential to make some sense of the world. He emphasized the importance of harvesting the wisdom of crowds and incorporating diversity. Wargames capture a particular model, often in a way that is accessible to players. Rigid games have very explicit model specification but may be too bound. Open games incorporate opportunities for innovation, but the model is often much less clear. Matrix games are a hybrid approach, which incorporate flexibility and leverage the expertise of participants. Computation and agent-based modelling can offer considerable insight into outcomes of complex systems, but the underlying model may not be accessible (and the user interface may be very important to allow the user to know what is going on). Volko also offered advice on game development, much of which hinged on the importance of repeated playtesting and encouraging feedback and critique. A stimulating on-stage conversation between Volko and Brian followed, examining the question of creativity. Martin Mull once said that “writing about music is like dancing about architecture,” making the point that you also need to listen to and experience music. Brian amended this to remark that “Game design is like dancing through architecture,” allowing one to experience the flow and form—although one also needs to game too. Brian’s usual design process isn’t always linear, but it is iterative. He has to have some initial interest. There then follows a period of incubation, which is followed in turn by moments of insight and inspiration during which the game subsystems develop. There are usually lots of ideas, and over time the bad ones get thrown out and the good ones are refined. Novelty is something which always attracts him to game topics and designs. At the same time, designs often borrow and adapt mechanisms pioneered by others in other games. Brian admitted to a certain degree of imposter syndrome at times, feeling that his work is less elegant or otherwise not as good as games designed by others (a remarkable admission from one of the world’s leading and most innovative wargame designers). The question and answer period followed, much of which focused on their favourite game systems and mechanics. It was a terrific session and format. Volko Ruhnke and Brian Train. Picture credit: Tom Mouat. The final day began with a panel on wargame execution, chaired by Howard Body (UK MoD). Aggie Hirst (KCL) spoke about play as pedagogy, examining the use of wargames for educational and training purposes in the US DoD military. She emphasized three main themes: play as a pedagogical tool, the role of immersion and player agency, and the value of critical thinking and “dialectical play.” She raised the question of whether immersion can interfere with learning, to the extent that reflexivity is undermined and players become objects, rather than subjects, of the game. It is important to use games to teach how to think, not what to think. This may involve punctuating immersion, thereby ensuring that players are engaged in a dialectic with the game. Her research will ultimately be published as a book (to which I am certainly looking forward). Next, Erik Elgersma (FrieslandCampina) spoke on wargaming as a hidden driver behind cheese market victories, highlighting the value of business wargamimg, whereby potential commercial courses of action are stress-tested. This approach serves as a team-building process that ultimately enhances capabilities. Participants start by playing Red, outlining the objectives and strategy of a commercial competitor. Having done this, they develop and then test their own plans from a Blue perspective. He stressed the importance of recruiting a strong project leader, choosing a suitable topic/scenario, ensuring commitment and support from principals, and ensuring the wargame has a clear focus. Good timing is important—wargames can be premature or stale, with limited shelf-life. A good team of participants is important, as is a good organizational culture in the room that encourages everyone to voice ideas. Good preparations (such as suitable pre-reads) pay off. Analysis and reporting must be clear, and not ambiguous. The findings need to be effectively integrated into business strategy. Finally, he stressed communications, communications, communications. Erik also mentioned how things can go off the rails, through poor representation of reality, hidden (political or organizational) agendas, or a mismatch between the game and the authority of participants. In the later question period, he noted that cheese marketeers are as vulnerable to mirror-image biases as any other analysts or game participants. Appropriately enough, digital wargame and wargame support tools were on display during the coffee and lunch breaks. These included SWIFT, as well as a Dstl demonstration on adapting augmented and virtual reality tools; NSC and iNet; Conductrr and TeamXp; and several games from Slitherine and Matrix Games. Using SWIFT to display, document, and facilitate a wargame. The next panel, chaired by Brian Train, explored wargame validation. LtCol Neil Stevens (British Army) and LtCol Ranald Shepherd (British Army) discussed selecting, playing, and assessing a commercial off-the-shelf wargame (in this case, A Distant Plain). They discussed how to convince the players that a COTS wargame was worth their time. After playing, participants reported that A Distant Plain had given them better appreciation of the broader context of counter-insurgency in Afghanistan (4.2/5.0 in a post-game survey), although it was somewhat less effective in offering insight into COIN warfare (3.78). Positive effects were noted in terms of practicing risk-taking, decision-making, and collaboration. Overall the exercise scored high (4.67) as an overall experience, both in terms of learning and enjoyment. John Curry (History of Wargaming Project) talked about wargaming and reality: a case study of the Ukrainian crisis, 2014-present. He questioned whether wargames had always had the positive effects reported. The interwar US Naval War College wargames, for example, were rather different from the way naval engagements were actually fought during WWII. He also quickly reviewed several wargames on modern warfare used for training during the Cold War era. There was not only significant variation in their assumptions, but also were wrong in some respects, or missed key issues (such as Soviet supply constraints). He used such observations as a preamble to examination the Ukrainian war. Fighting has highlighted the value of UAVs and indirect fire. MANPADS proved effective against rotary assets. Tanks remained powerful on the battlefield. Matrix games, he suggested, had limits in anticipating black swans and future developments such as encountered in the Ukraine. Some pre-crisis board games (such as Millennium Wars: Ukraine) placed too much emphasis on large formations, or otherwise failed to predict important developments. Digital games often made inappropriate assumptions too. John stressed that wargaming does have value, but that appropriate caution needed to be exercised in using them to anticipate future military challenges. In response to questions, he called for more research on what games proved prescient, and why. In a follow-up question I asked how we avoid demonstrating the value or weakness of wargaming by cherry-picking vignettes. He (quite rightly) responded by stressing the need to more systematically survey wargame outputs. Another comment noted that the benefit of wargames is also the cognitive development it encourages, quite apart from tactical/operational/strategic insights. It was also noted by panelists that wargames may contribute to networking and agility that proves of value when the unexpected is encountered. Also, the problem in some cases may be one of how game lessons are interpreted, (mis)applied, or missed, rather than the game itself. Phil Pournelle (LTSG) looked at refinement of wargames throughout the wargaming lifecycle. He emphasized that game methodology needs to be matched to the questions being asked, and what the designer or sponsor thinks about a game is not always what the audience (or the sponsors’ boss) thinks. Games need to be supported by a joint planning process prior to the game, and teams will have to adjust plans as they interact with adversaries. Insights from the game should then inform refinement of the next game. He also discussed capturing lessons, through rapporteurs, surveys, hotwash, and structured analytical techniques—and the strengths and weaknesses of each. He noted the particular value of critical event analysis to understand game trajectories and their drivers. These critical events may generate questions for future examination. Phil also discussed the Defense Wargame Alignment Group (DWAG) in the US Department of Defense, including the role of the Wargame Incentive Fund and Wargame Repository. In subsequent discussion, Phil stressed the importance of playing games widely to develop wargame design skills, and to acquaint oneself with the various techniques, methods, and game mechanics that are available. Phil Pournelle highlights the strengths and weaknesses of different wargaming approaches. LtGen Sir David Capewell offered a (retired) senior officer’s perspective in a presentation on wargaming to win in a volatile future. He stressed the value of wargaming as a method for fostering critical thinking skills. He argued that we are in the midst of a new and emerging geostrategic environment, characterized by the emergence of new issues and dynamics. He underscored the changing information environment, the challenged posed by (volatile) adversaries, and the “hybrid conundrum” whereby it is difficult to know how to respond to irregular challenges. He suggested that it was difficult to find Red Team players that could effectively represent this. There was much here I agreed with, and it was good to have such a senior (former) officer speaking to the group to offer a wargame-user’s perspective. However, it is also important to move beyond catch-phrases. Some aspects of change, it seemed to me, were overemphasized: geopolitics has always been complex and dynamic, especially outside the Cold War paradigm. Much of what is termed hybrid warfare is composed of tools and approaches that have been in use for decades, even centuries. I am not suggesting that there is nothing new—there absolutely is. However, what is key is to determine what has changed (irregular actors using UAVs) and what has not (massed artillery fires kill infantry), in a context of both continuity and innovation. For me, the most important contribution of the presentation was to underscore the need for wargame designers to wrap their games in appropriate jargon if they are to attract the attention of some senior decision-makers. In the subsequent question and answer, Sir Capewell was asked if he had ever changed his mind as the result of a wargame. He said he had. In the case of Afghanistan, wargames suggested that troops could be disengaged quickly and quietly at night, rather than having to first reinforce forward. He also pointed to the 2014 West Africa Ebola crisis, where wargaming highlighted the importance of cultural practice (notably body-washing and handling) in limiting the spread of disease. I found this a somewhat interesting response, given that this was understood by many public health professionals well before the epidemic, the issue being noted (for example) in humanitarian guidance sponsored by the UK Department for International Development in 2002. This suggests that planning wargames for senior staff may actually serve an educational function too, flagging issues that they might otherwise fail to appreciate from briefing or other materials. After lunch, a panel chaired by Colin Marston (Dstl) discussed various issues of wargame analysis. I was one of the panelists, so my notes here are a little more hurried. LtCol Rob Burks (US Army) spoke on US/DoD best and worst practices. He warned of the challenges posed by wargame teams without the necessary skills, unclear objectives and questions, and weak data collection and management plans. He stressed the importance of dialogue with the sponsor to clarify objectives and key questions, noting that while you can’t always get what you want, if you try sometime you find you get what you need. He stressed the importance of playtesting—and not only playtesting the game design, but the data collection and analysis plan too. Knowing who the players are is important, before the game design is finished. He also noted that games are at risk of being sidetracked, and that contingency plans and parking lots can be useful tools in game facilitation (“let’s park that issue now and get back to it later” so that you can focus on main issue). Peter Williams (DST) addressed designing analytical games with a view to successful data capture, management, and analysis. He outlined a holistic wargame design process, whereby understanding the client problem leads on to designing an appropriate wargame, collecting good data, undertaking good analysis to produce good answers. He emphasized the value of break-point analysis, which seeks to determine where and when the capability of force X is likely to work, and why—and the point at which it is no longer effective. A wargame needs to enable smart people to be smart (and innovative and devious), and the tools need to be present in the game to allow them to do this. I delivered my report on the DIRE STRAITS experiment from Connections 2017, addressing cognitive bias in wargame analysis (slides here). This was similar to the presentation I made in July at the Connections US conference. Our findings suggested that different analytical teams assigned to report on the same wargame might reach very different conclusions. Various types of cognitive bias (such as confirmation bias) might be responsible for this. The implication was that greater attention needed to be paid to how game analysis was developed and aggregated, including the possible use of a Red Team analytical cell to provide a possibly alternative perspective on the findings. The next session of the conference was an informal panel discussion on wargame facilitation, featuring Tom Mouat, Jim Wallman, and Paul Strong (Dstl), and myself. Various questions had been gathered from conference participants over the past two days, and Graham-Longley Brown acted as questioner. Some important issues were raised, including dealing with difficult players, the dangers of assuming a too-active role, and various mistakes we had made in the past. Finally, it fell to Phil Sabin (KCL) to make some concluding comments on the conference. The main thrust of his remarks was the need to increase the diversity of the wargaming community, in terms of gender, ethnic and national background, age, and experience. Connections UK did very well in attracting an international audience, with participants from 19 different countries. Judging from the sixty or so people who opted for the introduction to wargaming course, the conference also did well at bringing newcomers into the community. Half or more of those in attendance were not hobby wargamers, highlighting how effective Connections UK has been in expanding the community beyond the usual gaming geeks. Regarding gender, however, there remains considerable room for improvement. By my rough estimate, around 10-15% of participants (and fewer than 5% of presenters and panel chairs) were women—a somewhat lower proportion than at American version. This is, of course, an issue we have discussed before at PAXsims, and to the organizers’ credit the issue was raised and recognized repeatedly. Half of the PAXsims contingent (comprising myself and Tom Mouat, plus research associates Harrison Brewer, Kia Kouyoumjian, and Juliette Le Ménahèze, and volunteer Keiko Ivinson) were women, so I would like to think we made our own modest contribution in that direction. Overall, it was a very productive and stimulating three days. Having attended Connections US in July, it is interesting to reflect on the subtle differences between the two events. The focus and composition of the latter can vary a little depending on where it is held, but in general there are significantly more serving military folks with wargaming somewhere in their job descriptions or on their to-do lists. Connections UK seems to attract more with POL-MIL interests, as well as gamers who have some position or interaction with government but aren’t necessarily doing much official gaming. Given that US defence expenditures are around 13 times higher than those of Britain, that is to be expected. There is also a certain eccentricity to many British (hobby) wargamers that affects the official side too—I’m not sure that the UK megagame opener would necessarily translate well to a US professional setting. The US conference often delves deeper into issues of methodology (in part because of the efforts of people like Yuna Wong and Stephen Downes-Martin to deepen the intellectual and research foundations of wargaming). However, many UK (and European) wargamers are operating in more austere resource environments, and in some cases things that work in well-funded US wargames may be less feasible elsewhere in NATO and beyond. UPDATE: the conference presentations are all now available at the Connections UK website. The Connections UK 2018 conference for wargaming professionals will be held at King’s College London on Tuesday 4 – Thursday 6 September. Registration is open. Go to the KCL eStore website and register now! Registration closes on Friday 24 August. Duration. The conference will last three days. Tuesday 4 September will feature a concurrent megagame and a day-long Introduction to Wargaming Course for newcomers. This is an ‘either/or’ choice, although you simply sign up for Day 1 when you register. The main conference is on Wednesday 5 and Thursday 6 September. You can pay separately for Day 1 and Days 2 & 3—see below. Key note address by Volko Ruhnke: Wargames and systems thinking. Dilemmas and trade-offs in wargame design. Game design as a form of journalism. Developing the KCL Crisis Simulation. Developing an Arctic High North nested games family. Empowering Defense wargaming through automation. Selecting, playing and assessing a COTS wargame (A Distant Plain). Wargaming and reality: a case study of the Ukraine conflict 2014 – present. Creating and sharing best practice. Lessons learned from recent MOD wargames. US/DoD analysis: best and worst practice. Designing analytical wargames with a view to successful data capture, management and analysis. In the eye of the beholder? Cognitive challenges in wargame analysis. Games fair: two sessions, as usual. Facilitation workshop: a hands-on breakout session. Automation tools: stands and demonstrations. Location. The location will be Kings College London Strand Campus. Directions are on the KCL eStore web site at the ‘Location’ tab. Accommodation. Finding accommodation is an individual’s responsibility, but there are two Connections UK-specific deals to be aware of. The Strand Palace offers reduced rates for Connections UK delegates (£150 per night depending on room type), and KCL has cheap and cheerful student accommodation available (£59 per night). Details and links are on the KCL eStore web site at the “More Info” tab, and don’t forget to quote “King’s College London” when booking. Privacy. As a non-profit, the General Data Protection Regulation (GDPR) does not affect us that much. There is a privacy statement on the home page of the Connections UK website. Graham Longley-Brown has kindly passed on the following report on feedback from the Connections UK 2017 professional wargaming conference, and an early peek at what 2018 will look like. Many thanks to everyone who completed the Connections UK 2017 feedback survey, and a warm welcome to those who have expressed an interest in finding out more about professional wargaming. The Connections UK 2018 conference will be, as far as we can make it, a precise reflection of your views and requests in the 2017 feedback survey. The resulting conference outline is below. If this is of interest, please note the dates 4 – 6 September 2018 in your diary. I will distribute registration details presently. More details of Connections UK, including all previous presentations, can be found at the Connections UK website. Adopting a ‘deep, not broad’ approach accords with the Connections purpose, which is to advance and preserve the art, science and application of wargaming. So, this year we will concentrate on the ‘how to’ of wargaming, from design through execution and analysis to refinement. Expert speakers will talk in detail about the practicalities of designing and delivering wargames, and will include best practice and lessons identified, both positive and negative. The Games Fair and various breakout sessions will give you a hands-on experience of a large number of game designs and tools, and there will be plenty of time to network with many of the world’s best wargamers. The ‘High North’ was briefed last year by the UK MOD’s Development, Concepts and Doctrine Centre (DCDC). This remains a topic of interest for Defence. Games that feature the ‘High North’ would be most welcome at the Games Fair. DCDC’s presentation can be found here. There were a number of requests in the survey to feature the psychology of wargaming, human decision-making and such like. Rather than try to squeeze that – large and significant – topic into the 2018 conference, we are considering devoting most or all of Connections UK 2019 to this. Games selected to be shown at the Games Fair will qualify for one free place per game. Conference fees for all three days will be waived. Dates. Tuesday 4 – Thursday 6 September 2018. Cost: no change from 2017 (and 2016! ): £60 for the megagame/Introduction to wargaming day; plus £135 for the two main days. Connections UK is not for profit; the cost covers administration and food, which is provided. Themes. ‘How to’ wargame. Best practice, in-depth insights, and lessons identified in the wargame ‘steps’ below. You will note a striking resemblance between these and the MOD Wargaming Handbook, which is available online as a free download. Volko Ruhnke is a game designer with three decades of experience in the US intelligence community. He most recently served as an analytic instructor, making extensive use of boardgames in the classroom. He also is an award-winning creator of numerous commercial wargames, such as GMT Games’ COIN Series about insurgency and counterinsurgency. Brian Train has been designing conflict simulation games for the civilian market for over 20 years, with over 45 published designs to date. His articles and games have been published by a wide range of large and small firms. His special interests in game design are irregular warfare, “pol-mil” games, concepts of political influence in games, and asymmetry in games generally. In his spare time, he is an Education Officer in the Ministry of Advanced Education of British Columbia, Canada. Outline. Some details remain to be confirmed, but the conference structure should look like that shown below. The left-hand column includes the themes, or wargame ‘steps’, mentioned above, and shouldn’t change much. The right-hand column includes topics drawn from your feedback survey suggestions. These will be refined as we confirm speakers and chairs. Megagame This will be an engaging and fun ice-breaker on a serious and contemporary topic. Component production Informal evening session. Introduction Relating the conference structure to the MOD Wargaming Handbook wargame process. Design 1. Dilemmas and Trade-Offs in wargame design. 3. Design factors and choices. Development 1. Game mechanics and processes. 2. Play-testing and Test Exercises. (Look forward to Execution) Scenario execution. Key note address Volko Ruhnke and Brian Train. (3. Facilitation will be covered in a grand finale; see below). 5. Automation – break out and demonstrations. 3. Lessons identified from the analysis of the 2017 Dire Straits megagame. 2. Applying wargaming lessons identified to the real world. Refinement 1. Making wargames better. Facilitation (from Execution) Hands-on learning experience. Please email me with any questions. Registration details will follow presently. As PAXsims readers will know, the recent Connections UK professional wargaming conference featured a large political/military crisis game exploring crisis stability in East and Southeast China: DIRE STRAITS. This is the second time we have held a megagame at Connections UK, and—judging from last year’s survey—they are popular with participants. This year we organized something that addressed a series of near future (2020) challenges, said against the backdrop of uncertainties in Trump Administration foreign policy and the growing strategic power of China. We also conducted an experiment. Specifically, we decided to use the game to explore the extent to which different analytical teams would reach similar, or different, conclusions about the methodology and substantive findings of the game. If their findings converged, that would provide some evidence that wargaming can generate solid analytical insights. If their findings diverged a great deal, however, that would suggest that wargaming suffers from a possible “eye of the beholder” problem, whereby the interpretation of game findings might be heavily influenced by the subjective views and idiosyncratic characteristics of the analytical team—whether that be training/background/expertise, preexisting views, or the particular mix of people and personalities involved. The latter finding could have quite important implications, in that game results might have as much to do with who was assessing them and how, as with the actual outcome of the game. To do this, we formed three analytical teams: TEAM UK (composed of one British defence analyst and one serving RAF officer), TEAM EURO (composed of analysts from the UK, Finland, Sweden, and the Netherlands), and TEAM USA (composed of three very experienced American wargamers/analysts). Each team were free to move around and act as observers during the games, and had full access to game materials, briefings, player actions and assessments, and could review the record of game events produced during DIRE STRAITS by our media team. We were well aware at the outset that DIRE STRAITS would be an imperfect analytical game. It was, after all, required to address multiple objectives: to accommodate one hundred or so people, most of whom would not be subject matter experts on the region; to be relatively simple; to be enjoyable; and to make do with the time and physical space assigned to us by the conference organizers. It was also designed on a budget of, well, nothing—the time and materials were all contributed by Jim Wallman and myself. From an experimental perspective, however, the potential shortcomings in the game were actually assets for the experiment, since they represented a number of potential methodological and substantive issues on which the analytical teams might focus. To make it clearer what their major take aways were, we asked each team to provide a list of their top five observations in each of two categories (game methodology, and substantive game findings). All three teams did a very good job, and there is a great deal of insight and useful game design feedback contained within the reports. But what do they suggest about our experimental question? I have a lot more analysis of the findings to undertake, but here is a very quick, initial snapshot. First, below is a summary of each team’s five main conclusions regarding game methodology. I have coded the results in dark green if there is full agreement across all three teams, light green for substantial agreement, yellow for some agreement, and red for little/no agreement. The latter does not mean that the teams necessarily would disagree on a point, only that it did not appear in the key take-aways of each. I have also summarized each conclusion into a single sentence—in the report, each is a full paragraph or more. A Venn diagram gives a graphic sense of the degree of overlap in the team methodological assessments. One interesting point of divergence was the teams’ assessment of the White House subgame. TEAM USA had a number of very serious concerns about it. TEAM EURO, on the other hand—while noting the risks of embedding untested subgames in a larger game dynamic—nevertheless concluded that they “found this modelling fairly accurate.” TEAM UK had a somewhat intermediate position: while arguing that the White House subgame should have have been more careful in its depiction of current US political dynamics to avoid the impression of bias, this “obscured the fact that there were actually quite subtle mechanisms in the White House game, and that the results were the effects of political in-fighting and indeed, it could even show the need to “drain the swamp” to get a functional White House.” The various points made by the teams on this issue, and the subtle but important differences between them, will be the subject of a future PAXsims post. Next, let us compare the three teams’ assessment of the substantive findings of the game. TEAM USA argued that the methodological problems with the game were such that no conclusions could be drawn. TEAM EURO felt that the actions of some teams were unrealistic (largely due to a lack of subject matter expertise and cultural/historical familiarity), but that overall “the overall course of action seemed to stay within reasonable bounds of what can be expected in the multitude of conflicts in the area.” TEAM UK was careful to distinguish between game outcomes that appeared to be intrinsic to the game design, and those that emerged from player interaction and emergent gameplay, and were able to identify several key outcomes among the latter. As both the table above and the diagram below indicate, there was much greater divergence here (much of it depending on assessments of game methodology, player behaviour, or plausibility). Again, I want to caution that this is a very quick take on some very rich data and analysis, and I might modify some of my initial impressions upon a deeper dive. However, I do think there is enough here to both underscore the potential value of crisis gaming as an analytical tool, and to sound some fairly loud warning bells about potential interpretive divergence in post-game analysis. At the very least, it suggests the value of using mixed methods to analyze game outcomes, and/or—better yet—a sort of analytical red teaming. If different groups of analysts are asked to draw separate conclusions, and those findings are then compared, convergence can be used as a rough proxy for higher confidence interpretations, while areas of divergence can then be examined in great detail. I am inclined to think, moreover, that producing separate analyses then bringing those together is likely to be more useful than simply combining the groups into a larger analytical team at the outset, since it somewhat reduces the risk that findings are driven by a dominant personality or senior official. One final point: DIRE STRAITS assigned no fewer than nine analysts to pick apart its methodology, assess the findings in light of those strengths and weaknesses, and we have now published that feedback. Such explicit self-criticism is almost unheard of in think-tank POL/MIL gaming, and far too rare in most professional military wargaming too. Hopefully the willingness of Connections UK to do this will encourage others to as well! What is a wargame? Who should be playing wargames and why? How can simulating real-world events help to avoid real-world conflicts? In this podcast, we are bringing you five exclusive interviews with organisers and participants of this year’s Connections UK conference. The interviewees are Major Tom Mouat, Professor Philip Sabin, Patrick Kwasi Brobbey, Dr Anja van der Hulst, and Commander Matt Payne. The Connections UK is a conference dedicated to wargaming. This conference was hosted by the School of Security Studies and the Defence Science and Technology Laboratory. For more information about the conference, visit www.professionalwargaming.co.uk/ or read this BBC article goo.gl/iUYhyA. The DIRE STRAITS megagame was held on September 5 at King’s College London, and formed part of three days of activities, panel discussions, and break-out sessions at the Connections UK professional wargaming conference. You’ll find my overall report on the conference here, and a BBC report on the game here. In this blog post I thought I would reflect a little on the exercise: the rationale and objectives for the game, the scenario, game design choices, how it all went on the day, and what (if any) substantive policy lessons we can draw from it. Connections UK first held a megagame as part of the conference programme in 2016, when Jim ran War in Binni—a civil war scenario set in a fictional country. It proved very popular with participants, who expressed a desire that the conference organizers do something similar for 2017. However, since Connections is about improving the art and science of wargaming, and most of the participants are folks who participate in, design, or facilitate professional wargames (or other serious games), we thought that this time we might try to simulate a real, near-future situation. This is a more difficult challenge: the game designer needs to accurately reflect reality, and cannot play around with that reality solely to create more interesting game dynamics. There would be more than 100 participants, and so the game had to accommodate this many roles and sub-roles. Everyone needed to be engaged and involved. Related to this, we wanted people to enjoy themselves. Quite apart from whatever insight the game might offer into wargaming and its subject matter, it also served as a conference ice-breaker and networking opportunity. Participants would have a wide range of subject matter expertise and wargaming experience. The game would take up much of the first day, involving around 6 hours of game play (including briefing and lunch). Physical space was rather limited: one large room, and two smaller rooms. There would be no time for pre-reading. The game briefings had to be sufficiently straight-forward to enable everyone to assume their roles with minimal preparation. As if that wasn’t enough, we later decided to raise the bar a bit higher still by adding an experimental research component to the game. This would examine issues of convergence and divergence in wargame analysis. Specifically, would three different groups of analysts, each observing the same game and with access to similar materials and documentation, reach similar conclusions about the validity of the wargame methodology adopted and the substantive findings of the game? The megagame would give us an opportunity to explore this important question. Our very first thought was to do a China-Taiwan crisis, which gave rise to the title DIRE STRAITS. However, it soon became apparent that this would not easily sustain 100+ participants. Consequently, we expanded it to include other potential regional crises: North Korea’s development of ballistic missiles and nuclear weapons; China’s maritime claims in the South China Sea; and growing tensions between India and China. Virtually all of these issues were in the news, and indeed were increasingly so as the summer progressed. At the same time as we were developing the scenario, we also settled on a central question that the game would address: how would the unpredictability of US policy under the Trump Administration, and the growing strategic power of China, affect crisis stability in East and Southeast Asia? In order to make any such effects clearer, we set the game in early 2020. The Trump Administration was said to have survived the Special Counsel investigation, but suffered political damage. Parts of the Republican Party were in open revolt, and Trump faced a Republican challenger for the 2020 presidential nomination. North Korea was on the verge of resuming major weapons tests, and suffered from growing internal unrest. In Taiwan, revelations of Chinese (PRC) efforts to hack the island’s January 2020 elections had spurred a strong pro-independence backlash there. Just to push things along, we also planned an assassination attempt against North Korean leader Kim Jong-un for Turn 2 of the game. Marc Lanteigne (Centre for Defence and Security Studies, Massey University)., who specializes in Chinese and East Asia security issues, was kind enough to review our scenario ideas and confirm it all seemed plausible. Although he might disagree and break into post-traumatic twitches at the mere mention of DIRE STRAITS, it was (as in the past) a sheer joy to be working with Jim on this project. We quickly divided the work between us. I handled the scenario development and team/player briefings, the White House and North Korea subgames, and the “Connections Global News” media unit. He developed the overall game system for the deployment and use of military units, the maps, and most other game components. In developing the game system we very much emphasized relatively simple rules, with a very general combat model. With one week turns, large aggregate forces, and large areas of the region depicted, there was little need to model individual platforms and weapons system. Moreover, given that we were dealing with a series of crises that might involve more signalling than actual use of force, we decided to stress posture (how prepared and mobilized military forces were) and commitment (willingness to use force in a confrontation). The maps used a simple system of zonal movement. Again, with one week turns, fine detail was unnecessary. Teams were typically subdivided into a national leader, a foreign minister, a senior military commander, an intelligence chief, and one or more ambassadors. Each team would issue military orders (movement of forces, as well as changes in posture and commitment) using a Military Operations Form. Other major decisions (including options presented in the team briefing) were recorded using a Major Decision Form. In order to provide greater insight into goals and perspectives, we also had each national leader complete a Strategic Assessment each turn, while each intelligence chief completed an Intelligence Assessment to identify threats and likely future developments. The Koreas map. Other game maps depicted the Taiwan Strait, the South China Sea, and the Chinese-Indian border region. The White House subgame was an essential part of the design. In particular, we needed to recreate the uncertainties and internal power struggles of the Trump Administration. We decided early on not to have a participant playing the President himself, for fear that excessively crazy (or reasonable) behaviour might adversely affect the entire game. Instead, potential presidential policy directions were represented by various Tweets, most of them based on previous statements. Members of cabinet and the White House staff each had different policy preferences (anti-globalism, defeating the Republican challenger, confronting China, encouraging diplomacy, projecting American military strength, promoting the Trump brand, achieving a well-run White House, or “Making America Great Again”), and sought to influence the policy by moving various ideas up a snakes-and-ladders -type game board using White House Politics cards. Some of the latter are displayed below. White House players who had their favoured policies adopted by the President received Trump points. Amassing these was essential, for periodic staff shake-ups could result in the ouster of the lowest-scoring player. Once a policy was in place in a given issue area, it remained there until replaced. Of course, just as in the real world, US players would have considerable latitude in how to interpret President Trump’s statements. The North Korea subgame took a very different approach: we didn’t really establish much of a game at all, and asked North Korea Control (Tom Mouat) to improvise if need be. At the DPRK table we placed various displays indicating the various key power centres of the regime, onto which the players placed pawns indicating their loyal cadres. Not surprisingly, the Supreme Leader had the most cadres, and controlled the key positions. However, in the event that the assassination attempt succeeded, we envisaged using matrix-game adjudication to determine the success and outcome of any internal actions. Party Politics cards added some additional richness to this. Some of the North Korean Party Politics cards. It was important that lesser players retain support in the Central Committee lest they be purged. Kim Jong-un was also given—partly for fun, but also to simulate the demonstrative displays of public support that sustain authoritarian regimes by projecting omnipotence—a number of Obsequious Loyalty Forms. With these he could set his minions a task each turn, with rewards and punishments for those who exhibited impressive or disappointing revolutionary enthusiasm. One of the North Korea power structures displays, in this case depicting the Korean Workers’ Party. The others depicted the military, the intelligence and security services, and the civil government. The presence of a complex-looking internal politics game on the North Korean table was also intended to generate a sense of uncertainty and confusion among other teams as to what exactly was going on in Pyongyang. The US and North Korea subgames might seem a little satirical, and indeed were designed to allow the players to enjoy themselves. However, we were fairly confident that their actual outputs would be quite realistic. Statements from the US President would be rhetorical and unpredictable, reflecting his own views and the intense ideological, political, and personality battles within the White House. Indeed, most were simply restatements or tweak of previous statements made by Donald Trump during the election campaign or since assuming office. North Korean politics would be complex, but opaque to outsiders. This was also a case of designing for our audience, who we knew could appreciate the humour while remaining focused on their simulated tasks. With regard to our media team (Connections Global News), this Jim and I recruited outside the conference from among experienced megagame players and some of my former political science students (all of whom were veterans of my own intense, week-long Brynania simulation). The media play an absolutely essential role in such games, making sure that players are well-informed by providing a stream of generally reliable information. Jim was able to staff the various Control positions from among experienced gamers attending the conference. More game materials. Photo credit: Jim Wallman. When assigning players to teams, we did our best to match subject matter expertise and experience to roles. We were fortunate to have several people with expertise in the East and Southeast Asian security issues among the conference participants. Both Jim and I were very pleased with how it all went. The players remained extremely active and engaged. Team behaviours were all plausible. The Control members did an excellent job, and Connections Global News managed to tweet no fewer than 365 news reports in five hours of play, at a rate of more than one per minute. The initial CGN game briefing underway. Photo credit: Tom Mouat. The North Korean crisis attracted the most international attention. Kim Jong-un, who survived the assassination attempt thanks to his loyal secret police, approved testing of a multiple warhead version of his ICBM, and then deployed a basic SLBM system on modified conventional submarines. The missile tests took place over Japan, moreover. Each of his decisions was met with rapturous applause from members of his government (although one overly ambitious ambassador did have to be disciplined). North Korea’s Supreme Leader practices his very best resolute-stare-in-the-face-of-capitalist-neoimperialism. South Korea, Japan, and the US responded by placing forces on alert. South Korea decided to undertake covert efforts to promote peaceful change in the North. While the DPRK’s Supreme Leader (ably played by Brian Train) projected the revolutionary self-confidence one might expect of the vanguard leadership of the Korean Workers’ Party, I think that as they saw the build-up of military hardware in their neighbourhood they might have been a little anxious as to whether they had overstepped a little. Players react as CGN reports on a North Korean missile test. Photo credit: Tom Mouat. Unknown to most (except the CIA), South Korea also began secret preparatory work to enable it to launch an accelerated nuclear weapons development programme at some future point, if the need arose. The growing strategic threat from the North was the primary reason for this. However, Seoul was also concerned that US commitments were perhaps less reliable than in the past. This was a concern for Japan too. Things heat up around the Korean Peninsula. Photo credit: Tom Mouat. Indeed, within the US Administration there was a lively, and often confused, debate over how to respond. Some felt it was essential to send a strong message of US resolve, and indeed at one point US Pacific Command recommended that the US consider sinking a North Korean SSB to send a message. That was quickly ruled out by the Joint Chiefs of Staff and the Secretary of Defense. Others argued for caution, arguing if too much pressure was placed on Pyongyang the regime might respond in dangerous ways. The White House. Photo credit: Connections UK. When Pyongyang briefly hacked Donald Trump’s Twitter account, however, the President was furious. The NSA and US Cyber Command responded by briefly shutting down North Korean radio and television. Inside the White House. Photo credit: Ivan Seifert/KCL. A key point of difference within the American Administration concerned the role of China. Some favoured diplomatic outreach to Beijing to coordinate policy regarding the Korea crisis. Others felt China’s interests were too different from those of the US. Still others, with an eye on US domestic politics, were eager to advance the President’s trade policy by putting pressure on “#cheatingChina” to make economic concessions. The result was that US policy signals were mixed at best, reflecting as much the tug-of-war within the White House as the evolving strategic crisis on the Korean Peninsula. Meanwhile, the situation grew increasingly fraught, and a subsequent review of national intelligence estimates showed that several countries assessed the probability of war in coming weeks at greater than 50/50. Everyone on alert. Photo credit: Paul Howarth. US diplomats in their region, however, did their best to pursue a steady course, downplaying some of the President Trump’s more provocative statements and working with regional actors. China, Russia, and the US met to resolve the crisis, while both North and South Korea took steps to de-escalate the situation. The US also took the decision to expand and accelerate deployment of a range of ant-ballistic missile (ABM) systems (THAAD, Aegis, and GBD/GBI) to offset North Korea’s growing capabilities. Game play underway at CGN headlines are displayed on the room monitors. Photo credit: Paul Howarth. While all this was going on, the Taiwanese team—angered by the “Chrysanthemum Conspiracy” election hacking scandal—pushed for greater Taiwanese independence from the People’s Republic of China. When efforts to win observer status at the United Nations were blocked by China in the Security Council, efforts shifted to the General Assembly. At the same time, a constitutional reform process was announced, with considerable public support. Taipei hoped that Beijing would be too distracted by the Korea crisis to respond forcefully to these moves. France was particularly outspoken in supporting Taipei’s efforts, including a promise of arms sales. Tensions grow in the Taiwan Strait. Photo credit: Paul Howarth. The PRC’s response was rather less severe than one might have expected, Nonetheless, it did begin a build-up of naval forces in the Taiwan Strait, and sent a warning shot in the form of a massive cyberattack that disrupted internet traffic across the island. The US dispatched a carrier task force to the area, and President Trump at one point tweeted apparent support for Taiwan’s UN bid. However, back in Washington another heated debate was underway. Some favoured supporting democratic Taiwan. Other advocated abandoning President Tsai to win greater support from Beijing on the Korea issue. In the UN, the US refrained from actively supporting Taiwanese efforts. In the South China Sea, ASEAN countries found common ground in resisting Chinese maritime claims. Such enhanced regional cooperation seemed to be spurred on by a feeling that American support would be uneven going forward. France and the UK joined several regional countries (Malaysia, Vietnam, Philippines) in naval exercises, while Indonesia announced that it would be upgrading military facilities and constructing an airbase in the area. Several countries announced more active measures against Chinese fishing in disputed waters, resulting in a couple of incidents between fishing vessels and coast guards. Vietnam—adjacent to China, still smarting from China’s 2017 threats against an offshore oil project, and with bitter memories of the 1979 war between the two countries, was especially active in reaching out to other partners. It signed a secret agreement with the US to establish a joint signals intelligence facility to monitor Chinese military communications, concluded an arms deal with Russia, and allowed a Russian naval visit in conjunction with planned joint oil exploration in the area. Beijing was none too pleased by all this, but was preoccupied by other events. The Vietnamese team issues new military orders. Photo credit: Ivan Seifert/KCL. Amid all this, border tensions between India and China were quickly resolved. Although military forces were briefly placed on somewhat higher alert, the two countries quickly agreed to accept the status quo and reduce tensions. Thereafter India largely focused on economic development and pursuing amicable relations with its neighbours—except Pakistan, where tensions over Kashmir flared. And so it was that DIRE STRAITS ended with a few incidents at sea over illegal fishing and a some major cyber-attacks, but no open warfare. This, I think, was a very plausible outcome—although the Chinese response to signs of greater independence by Taiwan were rather less forceful than I imagine their real-world response would be. While it all might seem surprisingly peaceful in retrospect, many countries spent much of the game expecting war to erupt at any minute. We also saw the President’s beleaguered Chief of Staff dismissed from his post amidst White House intrigue, and his overwhelmed Secretary of State resign at the end of the game rather than be fired. After all of that, what conclusions might be drawn from the game concerning both the topic under examination, and the use of megagames as a serious gaming method? US policy under the Trump Administration is much less predictable than under any other president in modern times, a function of both the President’s mercurial and populist political instincts, and the clash between differing priorities and world-views within the White House. True, we had designed the game system to encourage this, but none of it was predetermined, and players could have taken a more cooperative route (as they did when deciding to increase the American investment in ABM systems). As White House Control, I was pleased to see how realistically and enthusiastically participants role-played their roles. Debate centred around different political views and goals, and not the manipulation of game mechanics. Domestic political concerns often trumped geopolitics. In short, if one builds a game system that models the existence of factions, rivalries, and differences within the current White House, one gets game outputs that look very much like current US foreign policy. The mixed and sometimes wildly oscillating signals coming out of Washington do less damage than might be the case because they are quietly spun, nuanced, and moderated by cabinet officials and ambassadors in the field. In DIRE STRAITS the Secretary of Defense, Chairman of the Joint Chiefs of Staff, Secretary of State, and various ambassadors played a key role in this. Indeed, it was precisely because he spent so much time trying to patch over problems arising in Washington that our simulated Secretary of State found himself with little influence in the Oval Office and was ultimately sacked. Despite this, uncertainties in US policy generate anxiety among American friends and allies. Neither South Korea nor Japan seemed to feel they could fully rely on Washington, as evidenced by the former secret decision to prepare a potential nuclear weapons programme. Taiwan was never quite sure how much latitude and US support it had, and Beijing was also left guessing about American commitment to the “One China Policy.” ASEAN countries increased regional security cooperation in part because US backing seemed uncertain. Several countries diversified their relations to counterbalance China and hedge their bets regarding American support. The game clearly showed that there are no good policy options regarding North Korea’s nuclear capacity, only less-bad ones. Everyone was wary of pushing Pyongyang too far. Toppling the Kim Jong-un regime was seen by most (but not all) as dangerous, since it risked retaliation or chaos in a nuclear-armed state. In this sense, Pyongyang’s nukes demonstrated their value as a deterrent. Rather than punitive strikes or intervention, a messy mix of threats, deterrence, sanctions, and diplomatic dialogue appeared to offer the best path to crisis management. US-Chinese cooperation was important, but undermined by mutual suspicion, as well as tensions between Washington and Beijing on other issues (such as trade or the South China Sea). Overall, the game seemed to suggest no meaningful path to denuclearization, a real risk that South Korea (or even Japan) might consider a future nuclear weapons option, and the reality of having to live with a nuclear-armed DPRK while mitigating the threat and deterring North Korean adventurism. Some of the media team (and me). Photo credit: Patrick Brobbey. Regarding the game method, there’s not much I would change. There were a few cases where misleading information circulated (CGN initially reported Taiwan was successful in its bid for UNGA observer status, and had to correct this—no such vote was held, and they would have likely lost), but overall the information flow and quality was excellent. The subgames worked well, and it was noteworthy than many/most non-American players were unaware that “Donald Trump” was a game system rather than a human player until after it was all over. Jim’s decision to dramatically simplify the military/combat system, and to emphasize issues of posture and commitment, was absolutely right. The map displays had just the right amount of simplicity and detail. The US analytical team. Photo credit: Connections UK. More analysts analyzing. Photo credit: Tom Mouat. We could have had more effective data collection, but here we were limited by the realities of the exercise. Teams did complete our military and major decision forms as required, but strategic and intelligence assessment forms were sometimes forgotten (or lost) in the hustle and bustle. All the news reports were archived, and pictures were taken of each game map each turn to provide a record of the military situation. Members of the three analytical teams freely circulated around the game during play, and were able to listen in on strategy discussions, negotiations, and sundry plotting. I’m eager to see what they will have to say. At the moment, it looks like we will be designing another megagame for Connections 2018 (pending the results of the participant feed-back forms). The subject matter, however, has yet to be determined. Ideas, anyone? BBC: Can war games help us avoid real-world conflict? The BBC has a report on the recent Dire Straits wargame at King’s College London, part of this year’s Connections UK professional wargaming conference. North Korea has just fired off an intercontinental ballistic missile over Japan. Japan is uncertain as to whether the US wants to start a war. It’s trying to find out why a massive American naval fleet has just arrived in the region. But it’s not getting any answers. There’s chaos in the White House as various factions try to influence the president. Some of this might sound familiar. But this is not real life. It’s the scenario in a war game called Dire Straits, set in 2020. And it’s being acted out, not on the world stage, but in a lecture theatre and seminar rooms at King’s College, London. I’ll be posting a full report on both Dire Straits and Connections UK in the coming days. Dire Straits live at KCL on September 5! …not Dire Straits the iconic 1970s/80s/90s UK rock band, that is—but rather, Dire Straits the megagame of East/Southeast Asian crisis stability. Approximately 100 participants will spend much of the day examining a series of near-future (2020) challenges—North Korean nuclear weapons development, cyberattacks and an election scandal in Taiwan, conflicting maritime claims in the South China Sea, disputed areas of Chinese-Indian border—in the context of growing Chinese strategic power, and an unpredictable and uncertain US administration. How the US would respond in a major crisis is unclear, given both the unpredictability of the President and uncertainty within the US political system. Although cleared of any direct collusion with Russia by the Special Counsel investigation, a few Trump associates were indicted for lesser offences. This, coupled with political reversals in the 2018 Congressional midterm elections and several major policy missteps, has left the Trump Administration politically weak. President Trump faces opposition within his own party to his re-nomination for the November 2020 election, an issue that will only be resolved at the Republican national convention this summer. His main Republican Challenger has accused him of failing to deliver a resolute defence of US national interests, while the current Democratic Frontrunner has warned that desperation might lead the Administration to adopt a more reckless foreign policy. Jim Wallman and I are designing the game, and we have an elite Control group ready to make it all that emergent game play magic work. We’ve even brought in an outside SWAT team of experienced megagamers and former McGill students to play the role of Connections Global News. If you’re not attending Connections UK, we’ll let you know how it all went! The main conference component of the 2016 Connections UK professional wargaming conference started on Wednesday, with a record 160 participants registered—the largest Connections UK meeting to date, and the second largest Connections ever. In the opening session Graham Longley-Brown highlighted the renewed interest in wargaming across the UK military and in the public realm. Among the many things he pointed to were the Sandhurst Kriegsspiel, the various Connections conferences, and the recent publication Zones of Control, edited by Pat Harrigan and Matthew Kirschenbaum. Having done so, however, he raised the question of how best to institutionalize wargaming and build further capacity—the question at the heart of this year’s conference. Phil Sabin echoed these points, welcomed participants on behalf of King’s College London and the Department of War Studies. The first panel, chaired by ED McGrady (CNA), explored the psychology of successful wargames. Graham Longley-Brown (LBS Consultancy) started off by addressing high-engagement wargames. Wargaming, he argued, was about people, the decisions they take, and the resulting story-living experience. He went on to identify the various components that can contribute to this, including the need to keep players in a game flow that avoids both boredom and excess frustration, and inside the “bubble” of narrative engagement and suspension of disbelief. Next, Nick Hare (Aleph Insights) offered an excellent presentation on creativity in ludic decision-making. He noted that arriving at a solution involves a mix of both creative and critical (System I and System II) thinking— a cognitive process that we may not be well aware of when it is underway. “Analysis paralysis” tends to occur in the transition between initial assessment and deeper understanding. He noted that much of the literature on analysis focuses on shortcomings in critical thinking (such as failure to fully use information because of cognitive bias) rather than weaknesses in creative thinking (“failures of imagination”). He identified a number of games that encourage creative thinking (Pictionary, Dixit, Codenames, Diplomacy, A Distant Plain, D&D, Megagames). He suggested that (game system) complexity and legibility (maps, clear game concepts, theme) contribute to ludic encouragement of creative thinking. Finally, the ever-cunning Stephen Downes-Martin (US NWC) talked about wargaming to deceive the sponsor. Wargame sponsors, he argued, often have an interest in deceptive wargames that validate preconceived notions. Wargamers therefore need to learn how to deceive sponsors as a way of inoculating wargaming against sponsor manipulation. This can be done at the game development stage to directly deceive sponsors, or deceiving players during game play in order to deceive the sponsor and other stakeholders. Stress, over-confidence, and career pressures can be exploited to directly manipulate sponsors. Loopholes can be designed into a game that players will exploit in order to generate the desired findings. Having identified how wargames can be deceptive, Stephen then moved on to ways of dealing with all this in order to safeguard game quality: game peer review; monitoring player stress; engaging the sponsor; punishing but learning from cheating; matching game flow to level of war being gamed; identifying and monitoring ambiguous game rules and procedures; and rotating game roles. I asked about the dangers of too much creative thinking, whereby powerful narrative engagement leads players to forgo critical thinking about real-world feasibility. (This, for example, was a serious problem in my view with the Jane McGonical/World Bank EVOKE social entrepreneurship game.) Nick responded by stressing that the game model needs to root players in the plausible. Graham noted that he more often encounters the challenge of too little engagement rather than too much, but that the game controller should play a role in nudging players back to game objectives. Another questioner asked about the perennial issue of using dice in games, and the discomfort many military participants have with this. All panel members defended the integration of uncertainty through stochastic process. A member of the audience also asked about how one might deal with a situation where a sponsors insists on a scenario that is unwinnable (but isn’t intended to be). After a coffee break, we were given a brief one minute overview of each of the many games that would be available for play during the later demonstration periods. After lunch, we returned to discuss non-combat wargames, with the session chaired by Anja van der Hulst. Russell King started us off with an NHS emergency planning exercise. This began with a video announcing a plane crash onto the M-1 near Kegworth, Leicestershire. We were then presented with a series of challenges. Russell used this to discuss the approach he uses, which he sees as facilitated peer review rather than a game with a game control adjudicating outcomes. He noted that it can be hard to get senior people together to participate: they are busy, they are experienced, and they may view a major disaster as a remote possibility compared to day-to-day challenges. However, it is important and necessary that they prepare—indeed, in the UK, this is a professional and legal requirement. If the simulation is snappy, fun, respectful of professional expertise, and tailored to organizational needs it is easier to secure engagement. Russell King talks us through a brief emergency planning exercise. Mark Stoop discussed scenario-based policy discussion. Scenarios4Summits designs scenarios for senior (ministerial, head of government) audiences. This presents particular problems: senior leaders and their staff don’t like to be surprised, there are multiple political sensitivities, and the scenario needs to be very up-to-date. They work with professional actors and high-quality video, using realistic scenarios, detailed scripts, and considerable fact-checking. The scenarios are intended to act as a prompt to discussion. He stressed the importance of audience acceptance. Michael Lee discussed one approach to wargaming wide area persistent messaging in information operations. They did this by identifying technologies and approaches, grouping them into categories, and then developing comprehensive sets. The cells were given a chance to develop hypothetical capability sets, which were then tested against a scenario. The sets were then refined, and tested against new scenarios. Actual game play involved technology and platform cards: each Blue cell was allowed to select from a pool of these. The local population groups were profiled for literacy, ICT access, population density, and so forth. Set refinement and multiple scenarios encouraged innovative combinations. WAPM cards on display during the games fair. Much of the subsequent discussion addressed similarities and differences between the approaches presented by the speakers, as well elements of commonality (or differences) with traditional wargaming. One question regarding summit scenarios involved the tension between making scenarios simple enough for senior leaders yet complex enough for staff with subject matter expertise. Mark noted that while the vignettes were really designed for senior (ministerial) participants, the scenarios nonetheless provided an opportunity for technical staff to more fully inform seniors on the intricacies of the challenge presented. It occurred to me that a related problem might be that of senior participants posturing: that is, behaving in ways intended to impress counterparts, rather than more cynically pursuing national or political interests. The conference then moved to the first of two “games fair” sessions. In part years I’ve been running games, leaving little chance to see what other games were on display. This time I opted not to sign up for any so that I could tour the demonstrations. Unfortunately I didn’t manage to get pictures of them all. I’ll admit that I ended up volunteering myself to join Jim Wallman’s Wargame 2020 as part of the Red Team rebels holding Folkestone against a Blue attack. I think we did well in blunting the enemy’s offensive. Our MRL and artillery batteries, after they flattened Blue’s rear echelon support units and just before they were hammered by Blue counter-battery fire. Clearly the crews should have practised their shoot-and-scoot. The final plenary session of the day was my own keynote address on Ten (Not Entirely Randomly-Generated) Reflections on the Social Science of Wargaming. I won’t summarize what I had to say, since you can find the slides here, and the video below. There was a second opportunity to play games after dinner. I ended up running a hastily-organized game of AFTERSHOCK for a couple of officers from UK Standing Joint Force Headquarters and a few conference attendees. Thursday morning started of with a panel on computer simulation and technology, chaired by Éric Jacobin. Dave Robson and Samantha Black (NSC) presented on technology in support of wargaming, focusing on professional military educational wargaming. Dave argued that technology allows a platform to include communication tools, extensive information, and a common operational picture. Samantha argued that computerized simulations had several strengths, in that they supported rapid calculation (useful for calculation-intensive aspects such as line-of-sight, etc. ), avoided emotional bias, facilitated record-keeping and analysis, and are not always expensive. Validation of an educational simulation could be achieved through repeated use, and in many cases simulations only need to be “good enough” since they can be overridden by the White Cell. Digital simulations also can support humans-in-the loop to address aspects that aren’t easily modeled. Simulations are data-driven, which is both a down-side (data preparation) and a strength (supporting multiple use once the data is in place). Mistakes will be made, even by the computer and its model. These can often be treated as “fog of war,” although one can also roll back the simulation or override the digital simulation. Hide the simulation from the users, if possible. Reduce complexity (and be prepared to use subject matter expertise). Unique blend of rigour and creativity. Relatively quick or cheap (for what it does). CAEn in action during the games fair. He suggested that CAEn should not be used if you are short on time and money, if large scales (terrain and/or forces) are required, or if large amounts of quantitative data is required. The next plenary session featured Stacie Pettyjohn (RAND) speaking on strategic gaming—why it is languished, and how it can be improved. She started by defining strategic gaming, and contrasting this with operational-tactical gaming. Operational games vary in terms of both structure (low/high) and transparency (low/high). However, strategic games tend to be loosely structured, and most are (low structure/low transparency) seminar games. Indeed, she suggested, most seminar games are BOGSATs in which players “admire the problem” and many players arrive with their own “pet rock” talking points, resulting in few innovative ideas. She suggested that manual boardgames are often more useful (when a problem is well understood), since they provide a structure that focuses player attention. However boardgames do risk being dismissed by some audiences as juvenile. There was also a risk that the game rules might distort or misrepresent key strategic dynamics or interests. As an example of a strategic boardgame Stacie pointed to the Countering-ISIL game she is developing at RAND, based on ideas that emerged from the rapid game design session at last year’s MORS wargaming meeting. Having cofacilitated that session with Brian Train, Robert Leonhard and others I was particularly happy to see how those initial seeds of idea had developed! Stacie Pettyjohn discusses strategic wargaming. The next panel, chaired by Colin Marston (Dstl) looked at successful real-world wargames. Jeff Appleget (NPGS) offered a presentation, coauthored by Rob Burks, on wargaming at the Naval Postgraduate School. He offered several examples: wargaming hybrid warfare in the Arctic (as part of a course on the topic); countering ISIL’s foreign fighter recruitment; exploring the distributed lethality operating concept; defence support to civil authorities (using AFTERSHOCK as part of game design process); wargaming the US Army Pacific CONPLAN (which required considerable security vetting); undersea communication and other technologies; and mass atrocity response. On occasion they’ve done wargames for foreign sponsors, including Norway (hybrid threats) and the Royal Canadian Navy (non-lethal weapons for boarding parties), and also delivered wargaming courses in the US and abroad. Roger Mason addressed wargaming in the intelligence community. One challenge, he noted, is that once one designs a game it is rarely really clear what is done with it after you hand off the game. National intelligence agencies design their own games, use commercial games, commission games, and monitor other people’s games. Publicly-funded think-tanks (like RAND or CNA) are wargaming too, as are commercial intelligence providers (such as Wikistrat and Stratfor) and academic institutions. Even the Vatican uses scenario planning. Ivanka Barzaska (KCL) discussed understanding how missile defence affects nuclear deterrence and stability through gaming. She argued that Cold War era modelling of nuclear exchanges are outdated, since contemporary use would like be more limited and constrained. Her research proposes three strategic gaming events, using NATO and (ideally) Russian participants. The games are not intended to test hypotheses, but rather would form part of a mixed-method exploration of highly uncertain issues, acting as a semi-structured interview of sorts. The games could also serve as an informal Track 2 or Track 1.5 process to help educate official about the impact of BMD. In the subsequent Q&A it was questioned whether wargames were actually having any effect on policy, or whether they had simply become trendy tick-the-box processes. After lunch, Stephen Downes Martin (NWC) chaired a session on wargaming innovations. Paul Vebber (Naval Undersea Warfare Center) discussed wargaming for innovation. He identified several types of innovation, and emphasized that wargaming ought to form part of the broader cycle of research. Wargaming is particularly useful for issues that involve substantial human decision-making. He spoke of the value of gaming at the various stages of addressing a problem: problem framing, problem exploration, solution framing, synthesis (and game design), solution exploration (playing the game). Ellie Bartels (RAND) then explored resolving hidden information in open adjudication. Specifically she argued that open adjudication can be a key way of gaming emerging issues (especially when Control doesn’t know more about the issue than the players). However, many emerging issues (deterrence, hybrid warfare, cyber, terrorism, etc.) involve hidden information. Games may hide motivations, actions, capabilities, or effects. Masking actions, capabilities, and effects is more challenging than masking motives. She went on describe how to capture fog of war effects with limited map visibility, separate maps, or flipped counters, as well as the use of cards to keep information private. She also addressed alternative models for hidden information such as face validity (whereby players challenge processes when results seem implausible) and zero-knowledge protocols (where results are validated by repeated partial observation). There were a couple of interesting suggestions from the audience on additional approaches during the Q&A. Ellie addresses the challenge of hidden information in open adjudication games. Laura Hoffman (KCL) offered her perspective, as a former student, on wargaming at KCL. She was very enthusiastic about Phil Sabin’s conflict simulation course (and indeed disagreed with some of the cautionary notes I had sounded during my keynote address), although initially she felt out of her depth. She noted that she playtested and revised the game so many times that her friends grew sick of it, and was forced to play with family members over Skype. Laura found game design changed her perspective, offered an opportunity for a deep dive into her topic (the war in Darfur), and was a different learning approach. Subsequently she served as a teaching assistant in an undergraduate course, which provided a further opportunity to understand the educational value of gaming. She argued that megagaming and other wargaming was a better learning experience than model United Nations, and that there is genuine student interest in conflict simulation. One interesting question from the audience raised the potential difficulty of grading a game design. I co-facilitated the academic breakout group with Phil Sabin (KCL). Much of the discussion focused on the need to establish professional respect and validation for educational wargaming. I was struck how the challenges differed across disciplines and university settings. In my own field of political science, there is widespread support for games-based learning, and games-based analysis wouldn’t be difficult sell either. Conversely, Phil has often commented on the resistance he sometimes encounters from fellow military historians. In civilian university, especially in North America, instructors have considerable latitude as to what and how they teach. In the military, however, there are often hierarchies and institutional requirements that deter or inhibit pedagogical innovation. We also addressed labelling (“wargaming” vs “conflict simulation”), student interest, whether there ought to be an academic wargaming journal (I’m dubious), and how best to support the sharing of ideas and experiences (in part, to encourage others who might be interested in gaming but reluctant to try it to “come out of the closet”). There might also be scope for using new technology—for example, YouTube videos—to provide lessons in game design and facilitation. The hobby game group noted that they were an “expendable and deniable” resource for more serious gaming, able to bring historical knowledge, a different subculture, and extyensive experience in game design and mechanics. Their contributions might include support to Red and Blue (and other teams), playtesting, and facilitation expertise. The industry group addressed both the industry as a resource and gaming within the business sector. They noted the importance of having access to senior people. The concept of red teaming sometimes provides a hook which can lead on to wargaming. They also noted that interest among individuals doesn’t necessarily translate into continuing institutional support. The historical analysis group identified a lack of resources (time, money, people) as the major obstacle to institutionalizing wargaming and creating a safe space for experimentation. There was a general feeling that new officers were not necessarily well-prepared for the uncertainties of future war, and that getting at officers early in their careers and exposing them to quick (possibly recent-historical) wargames could be very useful. Those with experience in recent campaigns could be a valuable resource for this. There was also a need for outreach to, and sharing with, the broader wargame community. The professional military education group also stressed the need for accessible games, and the value of having games recommended on military reading lists. There needed to be more outreach and publication in appropriate venues, and more collection of evidence as to the effectiveness of wargaming as a teaching and learning technique. Student feedback is essential. The defence science and technology group raised the need for more cumulated knowledge, and the value of better understanding client needs. They pointed to a degree of disconnect between wargamers and technology. There was interest in, but debate about, an accredited professional society. Publication in peer-reviewed journal was also seen as valuable. Finally, the “front-line” military and civil group reported. They noted that wargames were occurring at various points in the planning cycle: risk assessment, planning, training, and exercise/response/capacity development. Wargaming is a planning tool that offers insight into how groups of people will respond to a challenge. Ivor Gardiner enthusiastically emphasized the value of wargaming as a cheap, highly effective training method that saves lives. Phil Pournelle made some overall comments. He identified one key cross-cutting theme was that of credibility: of the method, with superiors, and among participants. He also emphasized the importance of games being somewhere where it was “safe to fail,” and he also emphasized the importance of “catching them young.” Phil noted the vast reservoir of knowledge in the hobby and industry. He challenged the wargaming community to better understand the analytical needs of the US DoD, UK MoD, and other clients, and thereby be better able to make the case for wargaming. Matt Caffrey offered three more observations: first, the professional wargaming community does want the support of hobby gamers and industry; second, that we needed to document and archive wargaming more carefully, lest it be lost to history; and finally that no matter what wargamers do, young men and women will die—but if we wargame well, perhaps fewer lives will be lost and fewer resources spent. In summing up the conference, Phil Sabin said he thought it was the best yet. I have to agree. The presentations and discussions were excellent, the atmosphere was enjoyable and productive, and the networking opportunities were outstanding. Slides and recordings will be have now been posted soon to the Connections UK website. You’ll also find an account of the conference at Bob Cordery’s blog, Wargaming Miscellany. The serious conference component of the Connections UK 2016 professional wargaming conference starts tomorrow, with two days of plenary presentations, working groups, and game demonstrations. Today, however, many of the participants gathered to play the Civil War in Binni megagame, designed by Jim Wallman. The fictional country of Binni featured a dictatorial President, sectarian divisions, multiple rebel groups, terrorism, refugees, humanitarian crisis, conniving neighbours, a concerned and often divided international community, covert intervention, and UN agencies. New elections were held, but under the regime’s old electoral laws which strongly favoured the incumbent. When the President was reelected in a dubious ballot, Christian militias seized the capital. The President was killed, and the country seemed poised to collapse deeper into chaos. I served with Stephen Downes-Martin as the UN Control team, and my after-action review slides can be found here (although they will likely make little sense to anyone who wasn’t there). The photos below are courtesy of Tom Mouat. Everyone seemed to enjoy themselves a great deal, and some serious points were also made about wargame design and execution. Moves underway at the map table. Global News Network at work. The UN SRSG checks the map table as various negotiations continue. Christian militias seize the capital. The Connections UK 2016 conference for wargaming professionals will be held at King’s College London on 6-8 September. Registration is now open. The conference will last three days: Tuesday 6 September is devoted to a hands-on “megagame” active learning experience, and the main conference is on Wednesday 7 and Thursday 8 September. Purpose. The purpose of Connections UK, the original US Connections and Connections Netherlands and Australia, is to advance and sustain the art, science and application of wargaming. Connections brings together stakeholders from across the field (military, defence, scientific, hobby, commercial and academic) to exchange information, ideas, requirements and best practice. Programme. The latest programme is attached and also available on the Connections UK web site. The psychology of successful wargames. Non-combat (non-map and counter) wargames. Institutionalising wargaming and building the wargaming capacity. Professor Rex Brynen is the key note speaker, talking about Advancing and Expanding the Craft of Wargaming. The highly successful two-session Games Fair will again take place on Wednesday. Location. The Connections UK 2016 location will again be Kings College London, The Strand Campus, in the Great Hall and Edmond J Safra Lecture Theatre. Registration. Registration is open, but please note that the last booking date is 15 August, so do not leave this to the last minute! Register now at the KCL e-store web site. Accommodation. Finding accommodation is an individual’s responsibility, but there are two Connections UK-specific deals to be aware of. The Strand Palace offers reduced rates for Connections UK delegates (approx £135 per night depending on room type), and KCL has cheap and cheerful student accommodation available (approx £50 per night). Details are on the KCL estore web site at the ‘More Info’ tab. Points of Contact and further information. See the Connections UK website for the periodically updated 2016 programme, content of former conferences, etc. Coverage of previous conferences can also be found here at PAXsims. Please send general questions to graham@lbsconsultancy.co.uk or detailed queries concerning registration and administration to Bisi Olulode at olabisi.olulode@kcl.ac.uk. The slides, audio, and video from September’s Connections UK wargaming conference has now been posted to the Connections UK website. Yes, that’s me live-blogging on my laptop in the audience at Connections UK. In addition, you’ll also find a summary of the conference at Bob Cordery’s blog Wargaming Miscellany. The third and final day at this year’s Connections UK wargaming conference started with a panel discussion on wargaming best practice. David England, (Niteworks) talked about gaming, experimentation, and force development; Jeremy Smith (Cranfield) presented on validation and verification of a manual simulation, specifically the Rapid Campaign Analysis Toolset (RCAT); I talked about political-military (pol-mil) gaming; and Capt Ed Farren (British Army) made an excellent presentation on wargaming and officer training. 1. The very first step in political-military wargaming is to decide what you are doing and why. Is the game intended to generate ideas, stress-test existing ideas, horizon-scan for possible future developments, or as an experiential and learning exercise? 2. Is a game really the best approach to the problem? 3. Is a big or complex game the best solution to the problem, or can it be addressed as effectively with simpler gaming techniques, like matrix games? With regard to all of these observation I made the point that we should adopt a “toolkit” approach in which game design components are matched to purpose, rather than promoting a one-size-fits-all approach. I also argued for “responsible games evangelism” in which we addressed the weaknesses as well as the strengths of game techniques. 4. Everyone doing political military wargames ought to read Robert Levine, Thomas Schelling, and William Jones, Crisis Games 27 Years Later: Plus c’est Déjà Vu. RAND Corporation Report P-7719 (1991). 5. How you structure participation, and who is represented in the game, dramatically affects many game outcomes. In many pol-mil games it is difficult to know who to incorporate and how to incorporate them. 6. Idiosyncratic factors can have heavy influence on game play. Partly this is a positive thing, reflecting the ways in which games can generate emotional and personal engagement by players (a point made at the conference by ED McGrady, Peter Perla, Graham Longley-Brown, and others). However, it may also mean that personalities—unconstrained by institutions and politics in quite the same way as real world policy-makers—distort game outputs. 7. Considerable attention must be given as to how to capture and record game play, debrief players, encourage reflections, and carry ideas and findings forward into the policy process. The subsequent audience discussion of the panel presentations addressed such issues as the value of commercial off the shelf wargames in officer training; the impact of professional subcultures on the behaviour of game participants; and the relationship between learning styles and games-based learning. The third day of Connections UK 2015 had obligatory diagrams too–this one by Philip Sabin. After the coffee-break we came back for a panel on the synergies between hobby and professional wargaming. Phil Sabin explored the contemporary use of historical wargames, highlighting their value both in educational and academic settings and well as within the national security community. He placed particular emphasis on how wargaming and learning about conflict simulation helps (future) analysts to better understand and model current and future conflict. At the same time, he also noted that many contemporary hobby games are too complex or too unrealistic to be readily used for analytical or training purposes. John Curry (History of Wargaming Project) also looked at professional use of recreational wargames. He cited a number of examples of games that have been used by both hobbyists and the military, or which might be. He, like Phil, highlighted some of the limitations of commercial games too (accuracy, complexity, duration, process, topic, umpire roll-back). In response to a question about how well commercial wargames explored hybrid warfare, Phil made some excellent points about the way in which rules and victory conditions could incentivize players to engage in realistic behaviours, or be used to assess otherwise incommensurable costs and rewards. My group chose the last three of these, and I facilitated the design discussions for Thomas Crook: A Game of Human Trafficking. In our game proposal—intended as a professional red-teaming resource for those dealing with forced displacement and migrations issues—a half dozen or so players would assume the role of smugglers, and would compete to move migrants to Europe using a variety of possible routes and techniques. It was a great session with excellent input from everyone, and the emerging game design seemed very sound indeed. And so it all finally came to an end. Overall, this year’s Connections UK was outstanding—indeed, the best ever. I very much look forward to next year’s meeting.